Re: Are Tube Amps History? UnexplodedCow wrote: However, I'm not giving up my heavy amps anytime soon...and will just use 'em for weight lifting practice if nothing else. Well... amps, and Ford CVH engines. Hah! Yes, those, too. Maybe one day I'll bench press a V8 or something, if it were all aluminum. MatiasTolkki wrote: I think the end of Tube amps SHOULD come sooner rather than later, just because of the weight and expenses involved with them. Even a full-size head with tons of glass in it should only weigh about 40-50 pounds. If that's enough to make someone think twice, it's time to revoke their man card. I will say that I enjoy the light weight stuff these days. 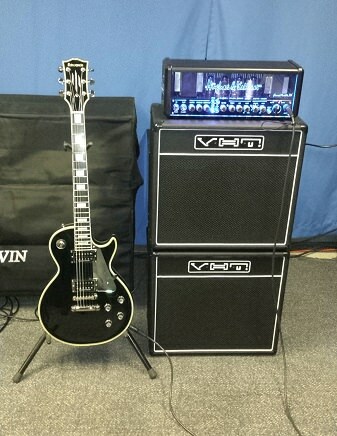 V3m and Legacy 3 are both very light for their power, plus they sound great. If more are never made, I think the amps will be remembered as forward thinking, at least. Smallest Guitar Amp Ever YouTube Music Is Win channel review of the Mooer Baby Bomb 30 power amp pedal ($108) driven by one of their micro preamp simulator pedals. Pretty impressive! Last edited by Omsong on Wed Dec 13, 2017 7:00 pm, edited 1 time in total. Tube amps going away? Nope! The full stack just keep getting smaller. Omsong wrote: Smallest Guitar Amp Ever YouTube Music Is Win channel review of the Mooer Baby Bomb 30 power amp pedal ($108) driven by one of their mini preamp simulator pedals. Pretty impressive! I just watched that video this morning on the way into work. Holy crap, that seriously blew me away. I mean, even if it sounded like garbage, the fact that it's 30 watts and something that tiny... Wow. Eegads on multiple levels. That was one of the flattest and most undefined Strat sounds I've ever heard. That had none of of the depth and shimmer of even a so so tube amp. The clean sound wasn't much different that a sound of a guitar plugged direct into a board, then routed out into a pair of monitors.. and his saving grace was the pair of celestion greens he went into which gave a hint of color but nothing like a tube amp. I turned off after the first round of"brown" after that. It's pretty tough to evaluate the true sound of an amp over the internet, especially YouTube. A number of years ago I went around to all of the local music stores (when there was still more than just Guitar Center) and played a bunch of combo sized amps. No SS amp gave me the organic feel and satisfying tone of tubes and I ended up buying a tube amp. I need to repeat that experiment since emulation technology has changed a lot since then. I really would like something lighter as my back can no longer handle lifting a 50lb box very far. There is some appeal to getting a small 1 or 5 watt tube amp and mic-ing it into a PA if I need a bigger sound. Omsong wrote: It's pretty tough to evaluate the true sound of an amp over the internet, especially YouTube. A number of years ago I went around to all of the local music stores (when there was still more than just Guitar Center) and played a bunch of combo sized amps. No SS amp gave me the organic feel and satisfying tone of tubes and I ended up buying a tube amp. I need to repeat that experiment since emulation technology has changed a lot since then. I really would like something lighter as my back can no longer handle lifting a 50lb box very far. There is some appeal to getting a small 1 or 5 watt tube amp and mic-ing it into a PA if I need a bigger sound. I think the current top emulation boxes give more of an "idealized" sound than anything. They sound more like a recording of an amp than the actual amp, but this is partially due to impulse responses emulating the mic'd speaker cabinets. It has come a very long way from the early 2000s, which is when I first bought a processor. I mostly use an Amplifire for silent playing/recording, and noticed that the Bassman model, in particular, sounds exactly like I remember my old Bassman head sounding like...maybe a touch more clear. As for SS amps, I've always enjoyed Roland's Jazz Chorus series, though ISP has made some exceptionally good sounding amps. The Theta and its predecessor (Waller models) can hang with a tube amp in terms of sound and dynamics/harmonic content. Those aren't exactly around in stores, though the Theta Preamp can be found here and there, and is certainly worth trying through a power amp. Unexplodedcow - thanks for your advice. I think most guitarists prefer tubes for the way they break up when driven hard. I personally play with a clean tone 95% of the time, so 'that' unique distorted tube growl is not my style. When shopping for an amp 14 odd years ago I found that tubes gave me clean tones that I found much more satisfying than SS. At that time, I picked up a Traynor that sounded luscious, but eventually I got tired of constantly dragging it up and down stairs. The straw that broke the camel's back (no pun) was when a power tube shorted and blew out some of its ss circuitry. (Don't recall what it was as the amp also had 12AX7 preamps. Maybe reverb? Don't think so as it had a tank... But, I replaced a blown transistor and IC along with a new power tube. ) That's a pretty rare failure, but it was a pain to get repaired. Last edited by Omsong on Thu Dec 14, 2017 4:51 pm, edited 1 time in total. Omsong wrote: It's pretty tough to evaluate the true sound of an amp over the internet, especially YouTube. . I think that's true to a degree--in reality, it's tough to assess the actual sound of an amp without actually being in the room and listening to it, because just in terms of mics alone, the sound can be changed considerably. I think that's just the nature of mics versus reality.. they lend a "patina." But compression to mp3 is something that all review uploads go thru on YT, so for me it comes down the rig of the person who uploaded the review. The fact that they all get converted to mp3 is a levelling factor that gives them an even start. From there it depends on the quality of the upload itself and whether the guy used a camera phone at a distance from the speaker or miked it properly with a decent mic. If the latter, then I think it's possible to evaluate what you're hearing. Characteristics of the (I guess you'd call) "tonal signature" of the guitar coming thru the rig remain in place after compression to mp3. The sound gets a little flatter and less 3 dimensional vs WAV, but the EQ and "the way an amp makes your guitar sound" are detectable. It reminds me a little of a convo I had w someone recently on the pics from soc media thread-- the Crescent top bout horn looks incredibly gigantic in those workshop photos, and it was pointed out that the angle and proximity to the lens exaggerates the look of the upper horn... but that's something that all guitars shot from that perspective on the bench have to deal with. It's the fact that that one model looks so extreme vs the others shot from the angle that makes me say "hoo-fa!" My youngest prefers tubes for their responsiveness, and their openness. Next, he talks about tone. But for him, it's these first two factors that appeal to him and that are first on his list because he says these factors are most central to everything else. My Tech 21 RK5 sounds bad-arse, is 100% analog, and can easily fit into a guitar case. I would present the Pepsi challenge to anyone either in a crowd or listening to Memorex to tell the difference between it and a great amp. Now sitting at home, in isolation in front of an amp....I'll sometimes fire up the dinosaurs and BAM...there it is. The bounce, bloom, chew, complexity, and dynamics, all there in spades. Now THAT sounds amazing. Of course, they are a couple of truly great amps so that never hurts. So I'll be keeping them around. Reminds me of my buddy's stereo setup. If you're in a car, with the road noise and glass refraction and stuff, good is good enough. Then I sit in front of his high-dollar vinyl setup....DAYUM, its freaking amazing. Everything you've ever heard a million times before is brand new and a hundred times better sounding. T00b amps aren't history. They are just a different kind of tool. I've listened to reviews of the Tech21 SansAmp Blonde modeling amp/speaker simulator that are pretty impressive. The big advantage of these analog modeling pedals (that I have read) is that they are small for a FLY rig and can directly connect to a PA or Analog Input and give a real time sense of playing into a real amp with no lag time. Some of the DAW simulator plug-ins and (pricey) standalone modelers like Axe FX and Kemper are apparently getting quite convincing, too. I wonder how close a tube preamp driving a SS power amp performs to an all tube amp - good enough? Also, a number of low power tube amps are presently available in the $350 to $600 price range that offer the benefits of tubes in a lighter weight, small combo or head form factor. They can always be mic-ed into a PA for more volume. Some even have line outs. Now, do those small tube amps really sound better than their analog SS counterparts? 1) Tubes are made by hand in aging factories by highly skilled workers who aren't being replaced. 2) Tubes have a horrible yield. 3) Tubes are grotesquely inefficient. At some point, there may either be a shortage or legislation that sidelines them. I'm really curious about the nuTube and whether it'll see widescale adoption. Can you imagine if 'BIG BROTHER' put an energy efficiency tax on products! Our beloved tube amps could quickly get priced into extinction! Speaking of tube amps, I just saw this video and thought that it is one of the finest illustrations of the differences that two iconic tube amps present on the same guitar. The seasoned old dude (so so player but man does he have some gear) plays a sixties Tele through a vintage Fender Tweed, then thru sixties Marshall combo (vintage Blues Breaker). And the sounds are so immediately iconic and instantly recognizable. He managed to capture very well the signature sound of both, for those who ask "how different are the sounds of a Fender versus a Marshall. The Fender instantly reminds you of so many classic sixties bands and pop hits from the studios in the South and on both coasts, and the Marshall instantly conjures up all those classic heavy British guitar sounds from the late sixties era. Doctor Turn wrote: Speaking of tube amps, I just saw this video and thought that it is one of the finest illustrations of the differences that two iconic tube amps present on the same guitar. After a couple of listens, I prefered the Marshall, perhaps because of the way it was mic-ed, but both are great. Then I heard THIS ONE of another original Fender Tweed that rips a sonic hole in the universal space time continuum! OMG, that is THE tone is to die for. ...and if the tones at 2:00 in THIS VIDEO don't put a smile on your face, nothing will! It would be really hard to duplicate one of these amps today since most of the new replacement components are no longer built to the same quality and specs. Chinese components might claim to have similar specs (to the originals) but no where near the quality and, therefore, resulting performance. You've just put your finger on why I'm saving so much money to put together 2500 to grab one of these. Materials (from Guitar Player review) "The Mercury V is well made and features a dovetail-jointed yellow pine cabinet covered in textured black vinyl with a beige front and white piping trim. The circuitry is true point-to-point, and other details include custom Carr transformers, Jupiter signal caps, and Analysis Plus and Transparent Audio cabling. At 41.8 lbs, the amp is a touch lighter than my reissue Fender Deluxe Reverb." I've spent close to five grand over the past 16 months building back up my guitar arsenal with the vintage-modern tones I hunt, and this bad boy, with its entire-history-of-Marshall flavor built into such a remarkable small one twelve combo, it's just irresistible. 2500 is a tiny price to pay. I'll be there very shortly. My X100b is a unique beast in the pantheon of great 100 watt road and studio amps.. I can get British flavored dirt out of it easily but underneath the hood with its big 6l6 tubes and Hammond spring reverb, you don't need to go much further than the incredible clean channel to know that it's a Fender pedigreed amp at dna level. I'm slavering for those dripping British tones from the new Merc.. The second video with Lance talks you through the settings and the ideas behind it's construction, and building in the jumpering the old Plexi two input/series/parallel on high/low channels, here with the flick of a switch.